Wigtown and Bladnoch extended their lead at the top of the South of Scotland League last Saturday when they defeated close challengers Mid-Annandale 4-1 at Trammondford Park. Following a goalless first half the home side scored three goals in a four minute period just after the hour mark to put them on easy street. Wigtown followed this up by converting a penalty with twelve minutes left to play before Connor Murray scored a consolation goal for the visitors. Creetown also continued their good league form when they scored five goals against Dumfries YMCA with only one in reply. In the first round of the league cup Lochar Thistle went down heavily to Heston Rovers in a Dumfries derby by five goals to one. St Cuthbert Wanderers ran out easy victors 6-1 against Lochmaben when they. Threave Rovers and Edusport Academy could not find the net even after extra time and in a penalty shoot out the Castle Douglas side won 5-3. Newton Stewart and Upper Annandale produced an exciting contest at Moffat in a five goal thriller with the visitors gaining the advantage to reach round two. 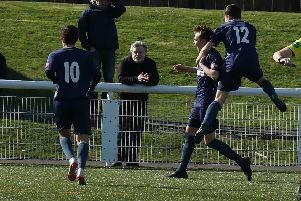 A deflected own goal gave the home side an early lead with Newton striker Ross McCrindle levelling the match before Uppers went ahead again with striker Mark Leighfield finding the net. The Creesiders enjoyed a better second half and after central defender and team captain Micky Wilson scored with a header from a corner the result of the contest could have went either way. With good chances falling at each end both keepers were on the top of their game until Robert Middleton broke away to race through to find a winner. Nithsdale Wanderers and Abbey Vale shared eight goals in their match at Sanquhar with Vale going through by virtue of a 4-2 penalty shoot out success. Dylan Cairnie and Chris Mellon put the New Abbey side two up and Kieran Kenny pulled a goal back for Nithsdale before Brodie Turner and Lewis West scored to put them right back into the mix. In the last minute the match was squared when Logan Hamilton found an equaliser. Stuart Campbell put the home side ahead but Chris Mellon equalised.